Nintendo announced at San Diego Comic Con that a retail version of eShop titles NES Remix 1 and 2 will be released in North America. 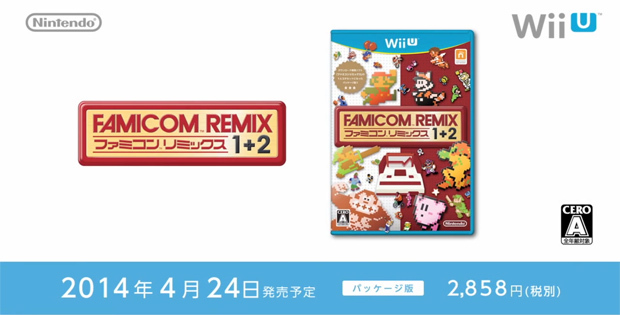 NES Remix Pack (pictured above) was released at retail in Japan earlier this year for a price of about $28 in US dollars, so we can likely expect a similar price point in the States. Well son of a mop. Well, that further solidifies my Dr. Luigi Club Nintendo prize. I could see this as being a nice Christmas gift to ask for. I would think this means a NES Remix 3 or a SNES Remix is out of the question for now. NES Remix 3 was pretty unlikely anyway because there isn't much left in Nintendo's NES catalog. Gumshoe isn't going to sell NES Remix 3. But I don't think this news means anything for SNES Remix. I don't see them marketing both simultaneously, so unless a SNES Remix came sooner, I'm thinking no earlier than 2015. Oh cool, now I can just rent it. Nintendo's line is that SNES Remix or Game Boy Remix could happen if there is fan demand. Maybe how well this sells could be a factor in that? Perhaps. A Game Boy Remix.... now that's interesting. Well, I doubt SNES Remix would be such a quick turn around anyway since it requires a new engine in a way NES Remix 2 didn't. So yea, probably won't come out until 2015 (if it exists at all). But if it weren't for that I think it's possible Nintendo could release both around the same time, with SNES Remix as a download title, since I think they see eShop games and physical games as having different audiences. But that's just a guess. Interesting, I'll probably get this since I don't plan on buying an external drive and I'm sure the fridge will fill up quick! Cover art is pretty rad too. I totally agree on that cover art. I want it bad! Saw this coming, which is part of why I got Game & Wario instead of NES Remix for Club Nintendo. Looking forward to playing this! Of course that's the art for JPN, watch the NA art be total garbage.